This slow-speed vertical juicer operates at 60 RPM to crush fruits and vegetables easily. The 3-inch-wide chute is large enough to accommodate bigger pieces of fruits and vegetables, so you won’t need to cut the food into small pieces before juicing. This machine is designed to resist clogging and has a reverse function in case a chunk of hard food becomes stuck. The strainer base and valve create a sealed space to contain the juice during processing to minimize oxidation. The valve should remain closed while juicing and opened to release the juice. This machine weighs a whopping 16 pounds, so it remains stable in use, while a handle makes it easy to move when you’re done. This comes in a gift-worthy box if it’s meant as a present. If you’re not sure this is the right juicer for you, there is a one-month free trial. While this brand is not as well-known as some others, the company touts its customer service, availability of replacements parts, and registration-free warranty. Meanwhile, customers praise the ease in cleaning and the super-dry pulp, which means that a large amount of liquid has been extracted. This machine has overload protection that automatically shuts off the juicer if the motor overheats, the power source is unstable, if the machine is improperly assembled, or there are other issues that could permanently damage the machine. Once the overload is triggered, the machine requires an hour before it can be used again. This vertical slow juicer operates at 47 RPM and has a dual-blade auger so it cuts the food and juices faster than typical juicers with a single auger blade. It also boasts the same torque you’d get from a 9hp motor which reduces the possibility of food jams and delays and the added torque also reduces the stress on the machine. This also includes a mincing attachment so the juicer can be used as a “food homogenizer” for making salsa, nut butters, or frozen sorbets. This has a juice cap, so you can control the flow of the juice so you can switch containers without spilling or leaking. The cap also means you can premix juice when you are juicing multiple fruits or vegetables, and dispense the mixed juice when you’re done. Closing the cap and adding water to the auger helps pre-rinse the juicing screen before cleaning. If you’re not quite sure you want to dedicate counter and storage space to an appliance that just makes juice, the Omega has a few extra tricks up its sleeve. It operates at 80RPM and has an exclusive dual stage masticating extraction system and five adjustable settings for the maximum output of juice, no matter what type of fruit or vegetable you’re working with. Setting 1 is great for the softest foods, like citrus, while setting 5 can handle tough foods like wheat grass. 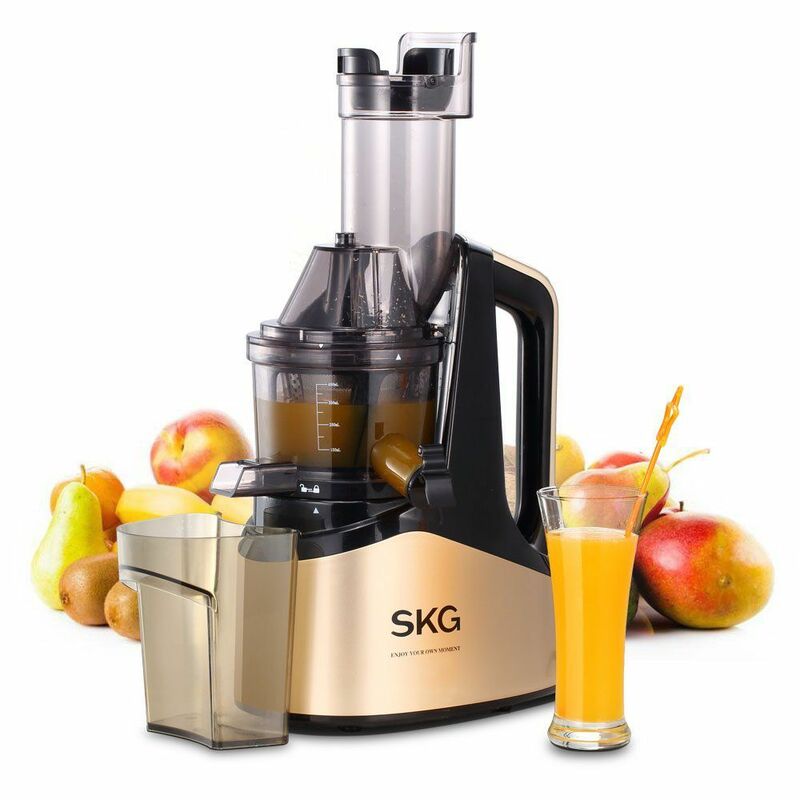 This has continuous juicing with automatic pulp ejection, so you don’t need to stop juicing until you need to empty your juice or pulp containers, so it’s great when you’ve got an excess of produce and you’re making a lot of juice. This is a horizontal juicer, so it takes up more counter space than vertical juicers, but it’s great when you need to tuck it under cabinets, because it’s not as tall. The horizontal design also means you feed food directly into the auger, so it’s slightly more efficient. Besides producing juice, you can also make nut butters, baby food, soy milk, or almond milk with this machine. When you’re not crushing fruits and vegetables, this can be used as a pasta extruder, using the included nozzles for flat or round noodles. A larger nozzle is designed for extruding dough for the perfect bread sticks. If you like the idea of a masticating juicer, but don’t want to spend top dollar, this vertical juicer has a lower price tag that’s more affordable. It operates at about 32RPM and has a 3-in-1 auger system that squeezes, filters, and collects the juice. The “smart bowl” that has 24 inner ribs with a very small space between the bowl and auger for more efficient grinding. The small mesh in the filter balances flavor and yield for a quality juice product. The 3-inch feed tube accommodates larger foods, so prep work takes less time, but the cover rotates for safety, so you can protect kids from sticking their small hands into the chute. This includes one replacement filter. The smart cap keeps the juice in, so you can mix juices before dispensing and keeps liquid from dripping and leaking when you switch or empty your juice containers. This vertical juicer is designed to work well, but it’s also designed to look good, with a rose gold color and a streamlined design with smooth curves that makes it look elegant and decorative on the counter top. This operates at 43RPM with patented slow squeeze technology that ensures that nutrients stay in the juice. This includes both coarse and fine strainers, so you can choose how much pulp you want in the finished juice. The pulp emerges “bone dry” which means the maximum amount of juice is extracted. Not only can you use this for fruits and vegetables, but it handles leafy greens, nuts, soybeans, and more. You can also create frozen treats by starting with frozen ingredients. Besides making a machine that extracts maximum juice, Hurom prides itself on spending decades optimizing juicer technology to create the best tasting juice. We bought a top-rated masticating juicer that our reviewers tested for eight hours. We asked our testers to consider the most important features when using this juicer, from its design to its functionality. We’ve outlined the key takeaways here so that you, too, know what to look for when shopping. Vertical or horizontal Masticating juicers come in two basic body styles – vertical and horizontal. The horizontal units are slightly more efficient because the food is fed directly into the auger, but as the technology has gotten better, the difference may not be noticeable to the average user. Horizontal units take more counter space, but vertical units might be too tall to fit under kitchen cabinets. Chute size A larger chute will let you add larger pieces of fruits or vegetables to the juicer, so there’s less prep work before juicing. However, larger chutes can be dangerous for curious children. Smaller chutes are safer, but you’ll be cutting your food to smaller sizes to make it fit. Extra functions Most juicers have just one function – turning fruits and vegetables into juice and pulp. However, some juicers have additional functions, making them more versatile. If you know you’ll be juicing regularly, the extra functions may not be of interest, and would just add extra cost and extra attachments to keep track of. This juicer came highly recommended by our testers for the quality of juice it produces. “The juices were very smooth and not pulpy at all,” raved one of our reviewers, who used it to juice a variety of fruits and vegetables, including cucumbers, ginger, carrots, beets, apples, and kiwi. Other highlights, according to our testers, include the easy cleanup and lack of noise. “The juicer is the quietest appliance that I’ve ever used,” reported one of our reviewers. Our testers struggled to come up with any negatives, but one of our reviewers did mention the motor is quite heavy so moving it from place to place isn’t easy. Overall? “I’m sold on the brand and model,” declared one of our testers.